Majorities of Republicans and Democrats approve of President Obama’s military plan against ISIS, but one group is not quite on board: younger people. While adults 50 and older overwhelmingly approve of the military campaign (59% approve, 23% disapprove), those under 30 are narrowly divided (43% approve, 37% disapprove). Older adults express more worries about Islamic extremism in general and ISIS in particular. In a survey last month, adults ages 50 and older were especially likely to say ISIS poses a “major threat” to the U.S. (76%). By comparison, 57% of adults under 30 and 61% of those ages 30-49 labeled ISIS as a major threat. Similarly, older adults are far more likely than younger adults to say they are very concerned about the possible rise of Islamic extremism in the U.S.; 71% of those 65 and older are very concerned about increasing Islamic extremism in the U.S. compared with 31% of those under 30. The age gap over U.S. military action against ISIS is different from the dynamic that existed in the lead-up to the 2003 war in Iraq as well as opinions during the Vietnam War. 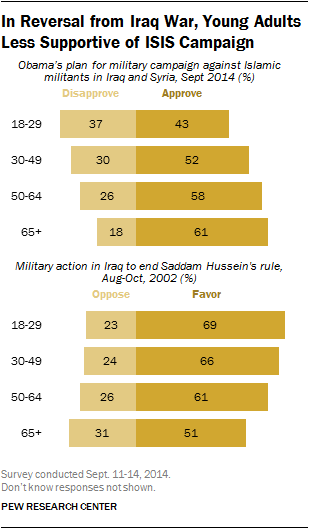 In late 2002, in the run-up to U.S. military conflict, it was older adults who were the most dovish about military action in Iraq. While adults under 30 favored military action by three-to-one (69% favor-23% oppose), adults 65 and older offered less support (51%-31%). And during the past decade of Pew Research polling, adults 65 and older consistently have been the least likely to say the U.S. made the right decision in using military force in Iraq. Contrary to some perceptions about Vietnam, young people were not necessarily more opposed to that war than older adults, either. In a March 1966 Gallup survey, as United States involvement in the war was about to reach 385,000 troops, most Americans (59%) said the U.S. had not made a mistake getting involved in Vietnam. People in their 20s were more likely to express this view than those 50 and older (71% vs. 48%). Even as late as May 1970, amid rising opposition to the war and protests on college campuses across the U.S., young people were divided over whether the U.S. had made a mistake sending troops to Vietnam (49% mistake, 48% not a mistake). 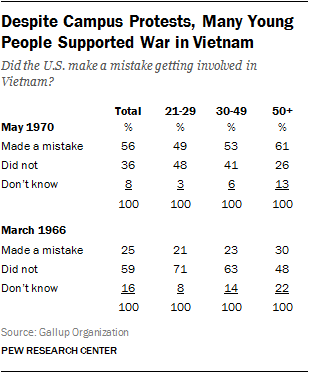 Among those 50 and older, 61% said U.S. involvement in Vietnam was a mistake while just 26% disagreed.